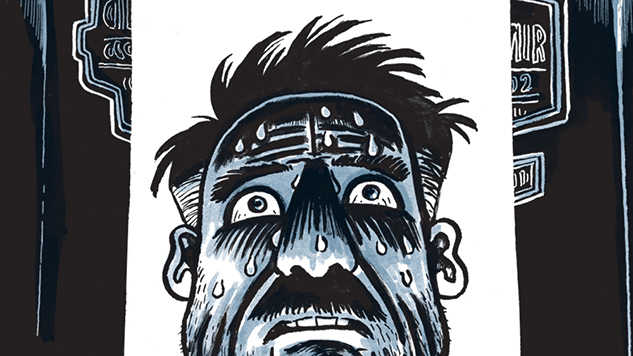 The cartoonist discusses his study of a zombie-loving train-wreck journalist over ten years. Cartoonist Joe Ollman is best known for his candid autobiographical material, which straddles the line between the works of Chester Brown (with fewer prostitutes) and Joe Matt (but less disturbing). His latest project, The Abominable Mr. Seabrook, is a departure. 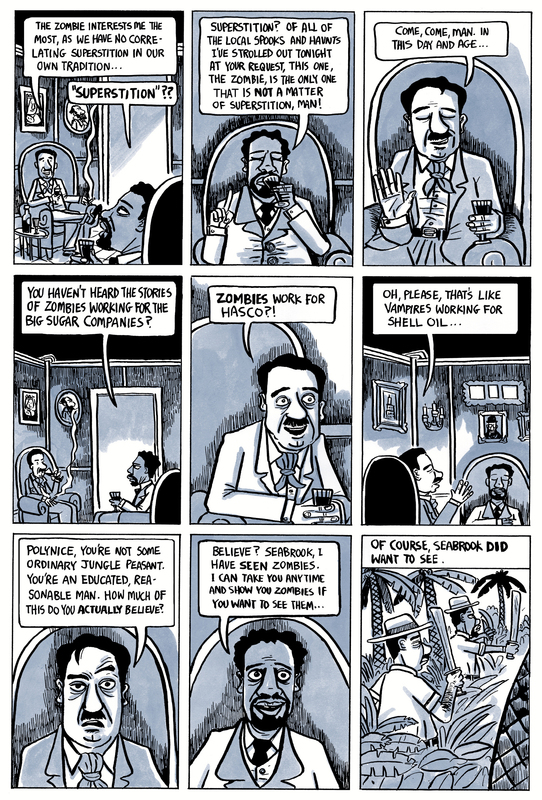 The graphic biography revolves around writer and adventurer William Seabrook, who traveled the globe and boiled down his journeys and strange encounters into best-selling books long on salacious detail. That’s not a very subtle description of the man, though, and Ollman presents a nuanced picture of a sadomasochistic alcoholic who drank himself to death. And he does so nicely. 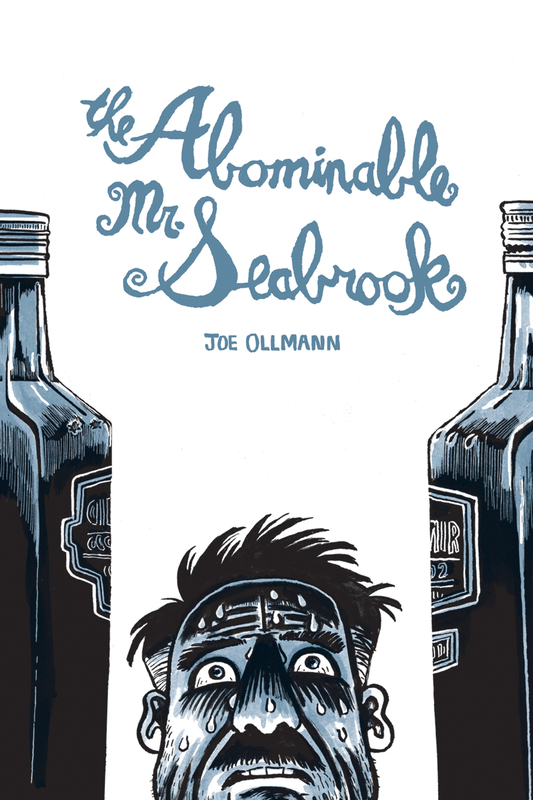 In The Abominable Mr. Seabrook, Ollman manages to synthesize his extensive research into an entertaining narrative—and not just because Seabrook was quite a character, socializing with Aleister Crowley and eating human flesh in the name of research. It’s a big book that reads quickly, and Ollman’s craggy art, which he’s quick to criticize, is carefully executed and well-suited to the material. Ollman answered some questions about the project via email and provided some insight into why he chose his subject. Paste: You’ve been working on this book for more than 10 years, counting all the time spent researching. Have you ever had another project that lasted this long? Joe Ollmann: Well, it was five years of actual dedicated work—writing and drawing. The other five before that were small fits of activity of different degrees, and then there were months when I didn’t even think about it, while I worked on other books. I didn’t even know I was going to do a book, I just kept researching him until it was clear I had to do something with all the info I had accumulated. I’ve never spent this much full-time work before on a book. Mid-Life took five years, but I was working full-time as an art director at a magazine and had a two-year-old kid at the same time, so it was slow for those reasons. Paste: Were you tempted to give up on the project? Ollmann: I think so. I mean, I was never even really sure I was going to do it. I think with any long graphic novel project you reach a point of that long-distance swimmer’s exhaustion, and you go up to your wife’s office and mime shooting yourself in the mouth and say, “I hate this, I don’t want to do this anymore, it’s stupid and no one will care, what’s the point?” But you know, maybe you get a pat on the head and a “there, there, poor sweet baby.” And you eat a bag of chips and you sit down and carry on. It really is a marathon, and you win it by finishing one page and then starting on the next. Paste: Is this your first work of non-autobiographical nonfiction? Are you an autodidact when it comes to this kind of research? Ollmann: Well, I had to look up autodidact, so that is telling. Ha! Yeah, I’m not from an academic background and this was all new to me. I worked with a reporter in the past to illustrate a story about the shameful practices of Canadian mining companies in Guatemala and other short pieces for textbooks, but nothing of this scale. It was kind of fun; wearing white gloves in university library and going through actual letters that this person you’ve read so much about had actually written. Fiction is easier and I want to return to that next, but I have another non-fiction project in mind and I’m currently buying every book I can find about it. Paste: How many different places did you go to do the research? Are there things you couldn’t work into the book that you really wanted to? Ollmann: I went to the University of Oregon and spent four days going through writer Marjorie Worthington’s archives there. She was married to Seabrook and wrote a biography of him in 1966. Sadly, Seabrook’s third wife burned most of his papers some time after his suicide, so Marjorie’s archive was a treasure trove. I also went to North Carolina to visit a Seabrook expert who had a trunk of photos and papers. My main sources were Seabrook’s books, especially his autobiography, No Hiding Place, and Marjorie’s biography. There were so many things that were just cool details, but didn’t advance the story I wanted to tell—just a straight, linear version of his life, and the book was already big enough. One thing that springs to mind is Marjorie describing visiting Alexander Calder’s studio in Paris and him putting on a tiny circus with his kinetic sculptures. I would have loved to add that but it would have been frivolous. There’s a film of this online. Paste: Are you the kind of person who reads footnotes/endnotes? Ollmann: I am. I think I always have had notes in the back of all my books. I like behind-the-scenes stuff. The notes in The Abominable Mr. Seabrook are way more extensive, but they are nothing on Chester Brown’s, the king of comic book endnotes. I was over at Nina Bunjevac’s house for dinner with Chester and Dave Lapp and I was showing them pages from the Seabrook book and Chester got all excited and said, “Will there be endnotes?” So, I left a note for him to find within the notes. Paste: How much photo reference did you need to do? And how did you go about that? Ollmann: Well, the gentleman in North Carolina had a lot of photos and Marjorie’s archives had a ton of pictures. There was very little on the internet when I started looking in 2006, but new things kept showing up. I’d find new connections in his life through the research and follow them and find more stuff, like a whole bunch of photos he collaborated on with [surrealist artist] Man Ray. I used more photo reference than usual as there were a lot of factors to consider, clothes and architecture in other times and other countries and historical characters. And the dreaded duo of cars and horses, things I hate to draw. All of this stuff is rendered through my limited abilities. I wish I could draw better and could have done the breathtaking vistas that I saw in my head, but you get what you can down on paper and then never look at it again. Paste: How did you know when to stop the research and start drawing? Ollmann: When I had read everything I could on Seabrook and worked really intensely on the script for years. There was no excuse to put it off anymore, but it’s a daunting task to sit down to draw a 300-page book. Paste: Duotones: Is it difficult to work that way? Do you color on the page itself or use a computer? Is that Seth’s influence at work? Does it have anything to do with the fact that this book is set in the past? Ollmann: I asked a lot of cartoonists what I should do, Photoshop or ink washes for the duotone overlays. I did some tests and got feedback on them. It’s definitely having seen Seth’s originals with the paper overlays, and Mimi Pond also told me to do ink washes, not Photoshop. So, the way I do it is I draw the linework, then tape an overlay to that, put it on a light table and add ink washes. I scan both layers separately and then combine them in Photoshop. The older I get, the more I want the originals to be completely hand-made. I make a point of drawing everything in my books, logos, etc., everything but the UPC. That just feels right to me. The duotones did seem to suit the book being set in the past for sure. I considered painting it all in color, but I’m colorblind and when I paint, I literally pester my kids; “is this a good skin color? Is this blue?” It wasn’t practical for such a long book. Paste: I know you also did some redrawing for this book, neatening things up a bit and adding a good bit more black. What prompted that? Ollmann: I almost always redraw the opening pages of every book I do. When you start a project, you don’t have as much of a handle on the style and the characters as you will by the end of the book. The opening always looks different and uncertain. I redrew the first 30 pages of Seabrook. [Drawn & Quarterly Executive Editor] Tom Devlin thought I was crazy, but he’s used to dealing with cartoonists. I made side-by-side comparison PDFs and showed them to my most-trusted cartoon people and they confirmed I was nuts. Nobody noticed the difference, really, but I did and you gotta do the work for yourself, ultimately. I’m really trying hard to draw better! I’m glad you noticed. I know my drawing is my weakest point (comics-wise) and I knew that a biography spanning cultures and continents needed visual pizzazz, so I really, really tried to do better. I also quit drinking in the middle of this book. I suspect not sipping bourbon all night while I drew may have upped my game. Paste: How did you first hear about Seabrook? Ollmann: Definitely. I keep saying to people, “it’s not Seabrook’s aberrations that interest me, but his willingness to write about them.” That interests me. I used that quote from Terrance, “I am a man, I hold that nothing human is alien to me,” as the epigraph for my book Mid-Life, which was partially autobiographical. I feel like that’s a quote that Seabrook would have embraced as well. I was also drawn to the hard-drinking writer thing that I shared with him. But during the research, you get more of the ugly reality than the legend, you know? Especially in Marjorie’s diaries, which were really heartbreaking. They would tell vastly different versions of the same events: in his, he’s a fun tipsy guy, in hers, not so much. I definitely came away from this project liking him a lot less than I went in, but in a way he’s like family to me. Paste: I’ve seen some of your early work that you’ve posted on your blog. When did you start making comics? High school? Ollmann: Yeah, I’ve always drawn comics. 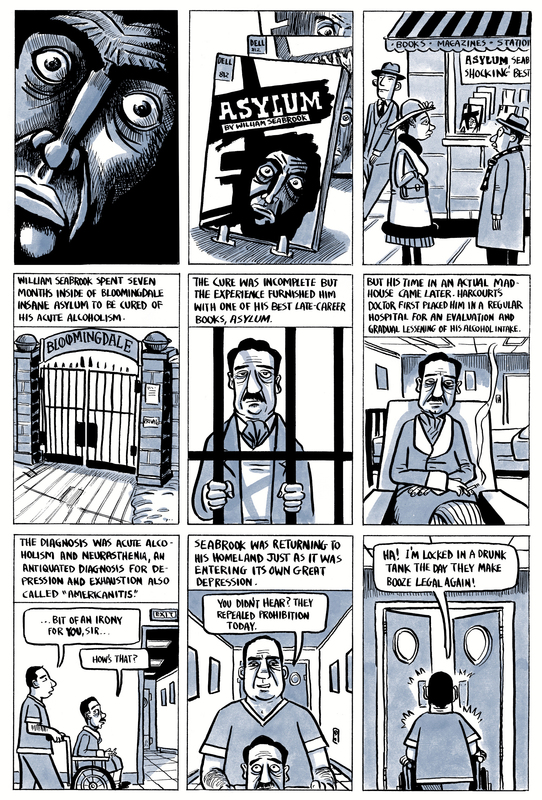 I spent a lot of time doing comics for newspapers in the ’90s that I wish had been spent building a larger body of books. But ah well, I had a weekly strip for five years and a monthly for another five. I’m glad for the experience and the opportunity of getting in before the death of regional comics in newspapers. Paste: Did you go to art school or anything? Ollmann: Ha, I did a one-year graphic design program at a community college. It was old school paste-up with rubber cement and galleys of type. Photo retouching with airbrushes, realistic drawings of shoes for ads, all of that. My class was the last one before they switched over to desktop publishing. So no real art training, no. Paste: And then you got married very young, right? How do you think you’ve been able to continue making comics for such a long time, despite having a family to support? Ollmann: I’ve always had a full-time gig. Comics were what I’d drag myself down the basement to do after a full day of work and my kids had gone to bed. But it was the thing I’d think about all day and couldn’t wait to get to. I worked myself out of a job a bunch of years ago when a production company bought the film rights to Mid-Life and then hired me to write a screenplay. It was real money, not comics money, and they wanted me full-time on the script. Anyway, I lived on that money for quite a while and didn’t go back to the full-time thing. And I’ve managed to scrape by with various comic freelance projects I’ve been lucky enough to get. I never mind drawing for money. When I was a 17-year-old, married with a kid and working in a box factory, I would have killed to draw for money. Also, I work part time in a bookstore.